I’ve spent more than 15 years teaching creative-professionals some of the most advanced techniques and technologies behind the latest graphic-design, audio, and video software and hardware. My heart, though has always been more keen on pure design and creativity. Long ago, I recognized the real bottleneck is neither in hardware or software, but in creativity. I call this the ‘blank screen’ syndrome. You get yourself the most powerful computer system with advanced components and peripherals; feature-rich and overwhelming authoring software, only to panic as you stare at an empty digital canvas for several awkward minutes, wondering what to do. At long last, my clients have also started to acknowledge this as their real problem and have started to ask me to focus on deeper and more fundamental disciplines. How to author anything that resonates with aesthetic beauty and creativity is indeed challenging. Teaching others how to do this is exponentially more challenging and exciting. It can’t be taught. It can only be caught. NewConcept is one of my clients bold enough to move in this direction. I’ve been training and consulting them in technology from time-to-time since circa 1998. A couple of my students have also worked with them on design projects through these years. Finally, in October last year, they invited me to professionally mentor their Research and Design team. 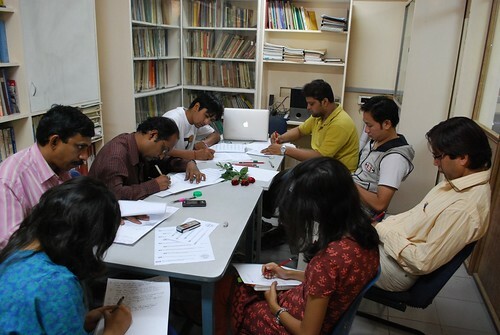 The mentorship program covers almost all disciples of design, creativity and media. Some sessions have been devoted to typography and publication-grid and design. Others on color-theory, color-schemes and trends. The team’s also honing its skills in photography and building a large in-house library of photos and images. We’ve covered digital print-production, and several sessions have focussed on the latest trends and techniques in web-design and user-interface. 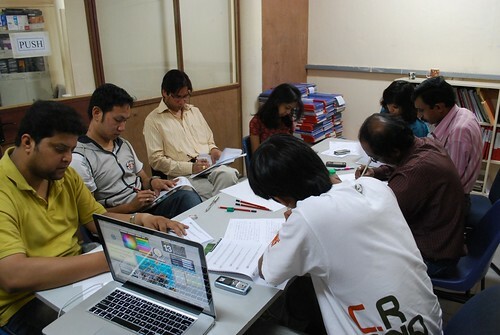 Together with the client-coordination team, we’ve also discussed pre-press and production technology. In almost every session we brainstorm on new and ongoing client projects. Plus, we also set up and fine-tune systems and processes for client-servicing, briefing, and profiling. Once in a while I’ve also delved into new features and technologies in the latest design software. At a professional level, combining creativity with people-skills is indeed quite exciting. Nurturing talent demands a lot of effort and sensitivity, and every insight shared needs to be backed with solid research and references. I spend hours scouring bookshops, libraries, and online resources to compile my references. In the process, am helping build a growing in-house library of reference, imagery, and color trends. Am blessed to work with a team of devoted professionals each with several years of experience. So far, they’ve always strived to fulfill their clients’ objectives. Personally though, I wish for them to break out of this mould and take a quantum leap in their creative aspirations. I wish for them to study and absorb the latest and most daring design trends; work on creating their own unique signature style; and usher in a fresh vision on design and creativity in their domain. I want the entire organization to start thinking in terms of design and aesthetics. And, along the way, I want them to win several international awards and recognitions. We certainly have a long way to go. The inspirations and standards I’ve set for them at times seem impossible. I merely chuckle. The initial six months of hard-drilling have started to bear some fruit. We’ve at least sorted out our color-moods and palettes. The team’s always eager to plug into its own photo bank for imagery. We’ve started to roll out a new branding and identity which may take a few more months to percolate down. Some of the newer web-design projects are significantly far-ahead of their earlier predecessors. The greatest challenge though, is to master typography with all its complex nuances. No trivial feat this, but after several months of trying I’ve finally devised a better pedagogy to achieve this. Finally, all this work is only possible thanks in turn to all my gurus of design. To learn is to share, and vice-versa. What every Indian must understand: Good language skills go a long way in furthering your professional career, personal life, and self-grooming. Poor skills betray the value and credibility of your education. Over the past five years, have noticed a rather alarming trend in India. Literate and well-educated people can no longer speak a single, proper sentence in English. They suffer from terrible mistakes in grammar and pronunciation. What is more embarrassing for them, is many of them have spent a fortune and have devoted two or three decades of their lives in acquiring their education. Yet almost anybody I meet or interact with, sounds illiterate and uneducated the moment they open their mouths. In the last ten years of my work as a journalist and editor, am dimayed to note graduates in English-literature from top universities, some armed with additional qualifications in Journalism and New Media, are quite insufferable. Sub-editors, who are normally in-charge of correcting spelling, grammar, and style, are themselves quite terrible, too. Web-search to discover how many bookshops have shut down in Delhi alone. The few surviving ones augment or even support their business with in-house coffee-shops, or by selling music, movies, stationery, and knick-knack. I seldom find people browsing through bookshops, or once inside, browsing through books. The writing-style of popular books today is a subject for another discussion. The English in our daily newspapers is appalling. This is even more ironic when you realize one of them claims to hold the record for the world’s largest circulation among English newspapers, while others contest closely for this top position. Mainstream English TV channels have presenters who should be pulled off the air and sacked, but it’s apparent there is a genuine problem in finding good people in a country with a population of over one billion. While I send my child to one of the best play-schools in Delhi, am distressed to note that some of his play-school teachers can’t speak English correctly. How do I shield his ears from imbibing their language? Most people have found clever and sly methods of hiding their incompetence. They all mix English with their local language, such as Hindi, Punjabi, Tamil or whatever else. This bastardization is deliberately made to sound ‘cool’, and Radio and TV jockeys heavily indulge in ‘Hinglish’ or other corruptions. The second trick is to use as few words as possible, and to be repetitive, all this to hide the sparseness of their vocabulary. They all tend to speak rapidly, as this hides their ignorance of pronunciation, tenses, and other inaccuracies. While speaking, only key operative-words are emphasized. In particular, the sharp consonants of some words are spoken loudly, while the rest of the words are merely mumbled. For example, “CARReer” or “CARRier” to hide their ignorance of the distinct pronunciation of each word. Some words are abbreviated, such as “congrats” instead of “congratulations”, and “vocab” instead of “vocabulary” . Eye and hand-gestures compensate for the rest. This deserves special mention. Graduates in their twenties and thirties cannot write, not even to save their skins. Many companies, sensitive to their image, enrol their staff into what I call ‘re-education crash courses’ to get them to send an email in comprehensible English. I often groan when I find PowerPoint or OpenOffice Impress slides beamed on big screens and to large audiences, with glaring spellings and other mistakes. As important speakers and guests-of-honour butcher the language on public-address systems, have often wished someone would invent technology to run live and subtitled-text for the audience. People I know, who speak fluently and once wrote nearly flawless English, have today sent their writing skills to the dogs. They never realized when they deteriorated to SMS-English in their formal letters and published words. I rarely find someone who remembers to spell ‘you’ as ‘you’, for instance. Indian authors may win the Booker prize and other international recognitions for their literary outpourings, but nobody seems to address the reality in every street, school, office, and home in India. For a few years in my profession, I foolishly imbibed the Hinglish-style of speech, and freely spoke in the incorrect English of my clients, thinking this would help me get my message across better. The worst thing I could possibly do to myself professionally and personally, was to discard my English and imbibe the atrocious language-style of my students in New Media and/or Graphic Design, especially from 1998 till 2007. This I did even when I was merely working as a visiting-faculty from time-to-time at a few institutes, and despite being a prolific writer, journalist, and an editor. The first metaphoric stinging slap across my face, came from my dear friend, and one of my gurus, Raj Mathur, who publicly admonished me in 2000, for typing in sms-English, on the linux-delhi.org mailing list. I immediately noted how I had to struggle with myself to break away from that habit and get back to proper spellings. Am so glad linux-delhi.org, a hub of obviously educated people, insists members use proper spellings in their public posts. This also helps web search-engines to accurately tag and index the often valuable information shared on the list. I appreciate Raj for correcting me, and am often disappointed when otherwise educated people on the linux-delhi mailing list make weak excuses, cite laziness, or even argue, for using sms-spellings in their posts. Little do they realize the negative impression they generate for themselves in the eyes of prospective clients and employers, as well as friends and peers. The second wake-up call followed almost immediately. I re-examined my professional writing and noticed my style had deteriorated drastically. It took me, and is still taking me, great effort to get back to my initial command over the language. Try this yourself now: Take pen and paper and see if you can spontaneously write two pages of text without sms-spellings, deletions, and other errors. Chances are you can’t. That was it. I suddenly remembered that for ten years of my life as a child, I did indeed have a private mentor who taught me English, and a love for poetry, literature, and books. Her name was Muriel Wasi, and with each passing day I fondly remember her as an old battle-axe. More about her in another post. Meanwhile, on receiving my Bachelors in English Honours from Delhi University, had enrolled for my Masters, and at one time, was all set to work towards a Ph.D in English Literature, until life had other plans for me. Twenty years forward I took a good and hard look at what I had done to my command over the language. I needed no further prodding. Here are details of how I personally improved my deteriorating command over English. I further refined my techniques so people who have always suffered from poor English-skills may also significantly improve themselves within a month. Stop using sms-English: All it takes is just another 50-paise, or even a rupee, for you to type a slightly-lengthier message in proper English. Consider it a valuable investment to make each time. For recurring messages, consider creating templates of pre-typed messages in your phone. I often insist friends and colleagues who sms me regularly, to only use proper spellings in their messages. Read at least one good book a week: Reading newspapers, magazines, brochures, and business and technical documents, is like trying to nourish your body exclusively on junk food. Just think: Have you read at least 52 good books in the last twelve months? If not, you know why you’re suffering. I threatened to hold back salary-increases for writers in a publishing team assigned to me during a consulting project, if I did not find them reading a book a week. I even threatened to fire them if they defaulted twice. Within a month of this stern condition, I noticed a dramatic improvement in their quality of writing. If you work with writers, consider implementing similar rules. Conduct a readability test: Nobody will ever tell you whether they found your written English easy or difficult to understand. Raj Mathur has developed a free and opensource web-application, that grades your text against various readability metrics. James Joyce would find it quite Useless, but this may just help you catch the Achilles heel of your writing-style. Discover it here: English Diction and Readability Tests. Speak slowly: You might find this difficult at first, as you try hard to distinctly pronounce each word, and watch out for mistakes with definite and indefinite articles such as ‘a’, ‘an’, ‘the’; with prepositions such as ‘of’, ‘in’, ‘on’, ‘at’, and more; and with your tenses. Learn correct pronunciations with howjsay.com: Just pay attention on how to correctly pronounce words you often take for granted. Try some words that most Indians tend to get wrong: ‘Career’; ‘Europe’; ‘Executive’; ‘Wednesday’; ‘Pronunciation’; ‘Project’ (there’s a difference between the noun and the verb with the same spellings); ‘Florist’; ‘August’; ‘Spectacles’; ‘Form’ (as in admission-form. Most people tend to mispronounce this as ‘farm’ or ‘pharram’); ‘Director’; ‘Invalid’ (the noun is distinct from the adjective). Stop using ‘Hinglish’ or freely mixing English with any other language. You will soon find you can’t speak the other language properly either. Avoid speaking in abbreviations: ‘Congratulations’ is better than ‘Congrats’, unless you do wish to make someone feel like a rodent. Correct, or else avoid, people who refuse to improve their language-skills. Why? You tend to imbibe their language. If i meet a client or colleague I can’t avoid, I silently correct all language-mistakes made by him or her, just so I can fence off the rot that may otherwise set in on me. Also, choose to spend more time with those who speak fluently and you’ll eventually notice a change in your style as well. It’s just human nature. Switch off from TV and radio stations that butcher the language. Choose instead, to watch at least one hour of good English TV programming, while paying more attention with your ears than your eyes. Tune in to a quality radio station, whether local or international, where your ears can soak up to abut an hour of good English. Avoid abusive or offensive language. It makes you sound rather uncouth. As you may see, the deterioration of your language has actually taken considerable effort and fortification of wrong habits by you, but what if you feel none of the above tips improve your English? I’ve successfully used the following technique with Hina Khan and Anshuman Kumar, two students am individually mentoring in various creative disciplines. Before Your Begin: Download and install, audacity, the free audio-editing software, on your desktop or laptop computer. You may get it from audacity.sourceforge.net. Buy yourself a reasonably good-quality microphone, or else a headset with a built-in microphone. Plug it in to your computer, and make a test recording in audacity, to ensure everything works. Step 1: Take a good book or magazine. Flip open a random and unread page. Record yourself reading that page aloud, for about five to seven minutes. Take care to speak slowly, clearly, and distinctly. Step 2: Close the publication. Playback the recording while keeping your eyes closed, so you can focus on what you said. Self-Test: Launch your favourite word-processor, like openoffice.org for instance, and type in a paragraph or more in summary of what you think you read, without consulting the publication or your recording. You might just feel quite disappointed or even aghast with your summary. Do this self-test just the first time you follow this technique. Step 3: Launch your word-processor, and while listening to and pausing audacity phrase-by-phrase, transcribe everything you read back into its written form. This step may be tedious, but it will help you a great deal. Once done, compare it with the original. Once more, you might just find yourself surprised at spellings or even words you thought you had read and uttered. Step 4: Close your eyes, listen to your recording one last time. Then open a fresh document and write a summary. Compare this with the original. Step 5: Finally, make a second recording, this time looking up the correct pronunciation of words on howjsay.com in advance. When you close your eyes and listen to this second recording, you may notice with increasing satisfaction, how much your spoken English may have improved within just thirty minutes of this exercise. Follow the above five steps daily, for about three months, and you’ll observe a startling and positive change in your diction and style. Deep down, we’ve learnt to forget to pay attention to, and listen to, what we say. When we read with our eyes, we tend not to listen to the words being read with our ‘inner ear’. When we speak, our ears tend not to listen to our own voice speaking. Our mind switches off and wanders off, or merely listens to words, without paying much attention to meaning. Hence all the errors made the first time anyone goes through this exercise. This technique is highly effective, because when you do get down to carefully listening to yourself reading that publication, you sub-consciously hear yourself using correct grammar and style. That re-inforcement goes a long way in spurring your speech towards correct English. So ultimately, only you could have paved the way out from your own deterioration, without requiring direct intervention or ongoing instructions from any other person. Amazing Fascinating, isn’t it?